Walking distance to the beach and town. 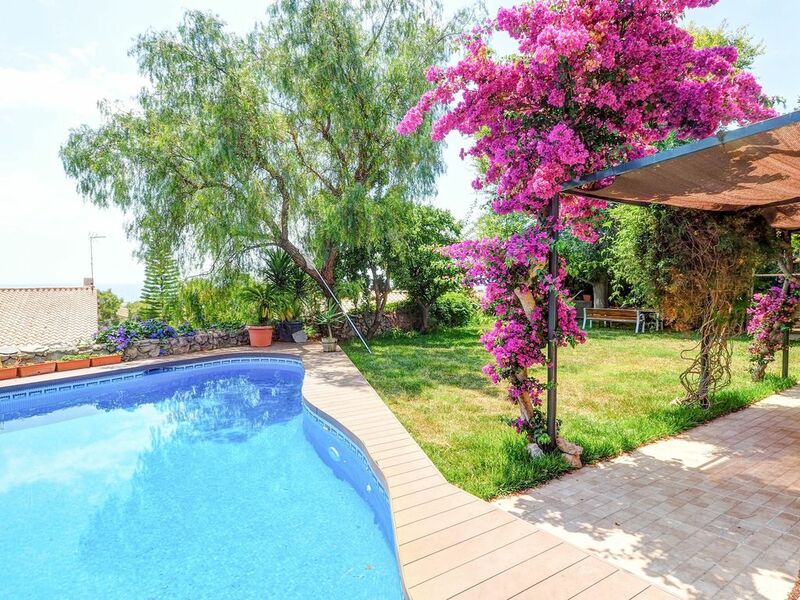 Beautiful villa with private garden and private swimming pool. Six double bedroom , 4 bathrooms. 1 garage for one car, and space in garden entrance for 2 cars more. Two kitchens. Wi Fi. TV. Satellite. CD, DVD music. In different areas of the house there are a billiard, and a ping-pong (table tennis). The entrance opens onto a vast living room through a sliding door leads into the kitchen with, oven, fridge, dishwasher, microwaves, Nespresso, and all the utensils that you will need. This floor, is very bright, large windows with access to a large terrace with panoramic view on the horizon, the sea and around the town of Sitges.There are six bedrooms in total, all with fitted wardrobes. One bedroom is a suite. All rooms have access to another large terrace with spectacular views or the garden . Large interior garden. Laundry. At the garden nivel has two double bedrooms, large living room, a bathroom, and the second kitchen. You can relax in a hammock and enjoy the coolness of the shadows of the huge elm tree located in a corner of the garden while the rest of your family enjoys the pool on the other side, plenty of sunbeds.. The house is located 600 m. from the beach or supermarket, and 1500 m from the center of Sitges. An urban bus take you to centre of Sitges in 10 minutes (bus stop 30 m. to the house). Hi there, We are Fernando, Alfonso and Nicolas. We manage a few Villa in Sitges and we know well the needs that guest have and we try to give the best experience. Our Villas are prepare very comfortable and If there is anything missing or need we will provide it at the same day. We hav4 multple offer for you in Sitges and BArcelona. Restaurant suggestions, activities oportunities, night life, private transport at taxi price ,-) Our guest experience is 10! Come to stay with us and enjoy your holidyas. Huge, comfortable, private garden and swimming pool, wonderful views. One of the bathrooms is in a suite. You can walk to the city center a 10 minutes walking. Linen are available at no extra cost. All linen are provided and changed free of charge for bookings of 2 weeks or more. There was enough room for our quite large party. Everything was in good working order. Loved the garden with pool! Conveniently located in a quiet neighborhood. Very nice owner! Would definitely recommend it! Muchas gracias a todos ustedes! This villa is a beautifully designed home, with every reception and bedroom having their own balcony/veranda and sea views. We had decided not to hire a car and having my elderly father with us it was important that shops and restaurants were within a short walking distance.The main town of Sitges is a short walk, as are the beaches, shops and restaurants, however the villa is up a steep hill so my dad did need assistance with it. The property is very well maintained, left spotlessly clean for us and is very well equipped. A private pool is always a must for us, and the full size pool table was an extra bonus, and kept our teenage boys very entertained. Daniel and his wife could not have been more accommodating, helpful and we received a very warm welcome. Daniel even drove my sister to the local hospital when she had an allergic reaction. Daniel also gave us advice on traveling by train into Barcelona, which we did, and advice on the best beaches and restaurants in Sitges. I would highly recommend this villa and thank Daniel for helping to make our holiday so relaxed and enjoyable. Tank you very much, Veronica! The house is great and very confortable to stay. It has got everything you need icluding nice BBQ area, hamaca...and the swimming pool was great. Is just 10 minutes walking to the harbour and beach and 20 minutes walking to the town centre of Sitges. Is a great location because is a quiet area, with amazing views and close enough to all amenities. We felt very confortable and the Landlord Daniel and his wife were very nice and helpful. We really enjoyed our stay and I would definetly recommend it. Thanks!!! Thank you very much, hope you have been a good holiday and have a good year. A hug, Daniel. We had a wonderful vacation in La Nau The house was perfect. It was close to the supermarket, many restaurans and the beach. It is a little hike to the beach, but it was easy to get to everything that it wasn't a problem. Liliana y Daniel greeted us and made us feel right at home. They left their info incase we needed anything during the week. We were given lists of places to go and see! The property was very clean and well maintained. I have already passed on the link to this property to several of my friends! While we stayed there we drove to Barcelona, Tarragona and Park Aventura. And the rest of the time we went to the beach and enjoy the magnificent garden with pool and BBQ. I could recommend this house to anybody. We were a family of 10. Grandparents, parents and children at the age of 3, 5, 8 and 11. The house was big and gave us the space we needed to be able to have some time from each other. The walking distance to the beaches and the town was not far and gave us the exercise we needed. There is a nice garden with a lawn where the children could play and a nice swimming pool. It was clean and well maintained and the owner provided good customer service. Both he and his wife was nice, helpful and very friendly. I would really love to come back. Tank you very much, Else. This beautiful villa is located at only 10 minutes walking or 10 minutes by bus to the artistic centre town of Sitges, with its fabulous beaches and night-life. . Sitges caters well for families with is wide boulevards and great variety of local and international cuisine. Combine the comfort of a private villa with day trips to Barcelona (40´) and Tarragona, (50´) and the nearby Villanova (7´) with its typical traditions. You can visit the famous wine cellars of Torres, Cordorniu and Freixenet. Highlights: Zoo and Science Museum, Ramblas in Barcelona, amusement park Port Aventura, Picasso, Gaudi and Miro, tapas and paella! And many sports available around the zone. Golf: Sitges provides a picturesque setting for a game of golf. It is located on the coast and enjoys warm Mediterranean weather. Sitges has two main golf clubs, both slightly outside of the town centre. The closest is the Terramar golf club, located 25 minutes walk from the town centre. If you are looking for a fun family activity, there is also mini-golf in the city centre. Ski: La Molina is well-situated, surrounded by mountains of more than 2500 metres. La Molina is the nearest ski resort to the main cities of Catalunya and large parts of Spain. It is readily accessible by car, bus, or train. After nearly one hundred years of operation, La Molina has the experience to maintain its position as one of the premier ski resorts of Spain offering the newest technology and services. Recent expansions were engineered to respect the environment and the needs of the customers. As a result La Molina has received the awards ISO 14001 for the Natural Environment and the 'Q' of Tourism Quality.